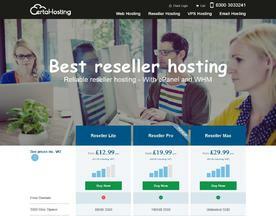 UK Reseller Hosting providers offer a web hosting service where the owner of a server or hard drive space can allow other people to host their websites using their hard drive space and bandwidth for a fee. If you’re looking for online services similar to UK Reseller Hosting, consider our Shared Web Hosting or Cheap Web Hosting categories. Reseller Hosting loaded with features. cPanel + WHM, CloudLinux + CageFS + PHP Selector, Free RVSkin, Free RVSiteBuilder Pro, Softaculous, Backups every 6 hours, Free R1 Backup / Restore & Unlimited cPanel accounts. You’re safe in our hands. Certa provide powerful web hosting services for businesses, developers, designers and resellers. Our super-fast SSD RAID10 storage technology enhances the performance of your sites, along with the reassurance of hourly backups which are held for 30 days.